Fan favorite author Kasie West delivers an effervescent story about chasing your dreams and following your heart, perfect for fans of Jenny Han and Huntley Fitzpatrick. Lacey Barnes has dreamed of being an actress for as long as she can remember. So when she gets the opportunity to star in a movie alongside one of Hollywood’s hottest actors, she doesn’t hesitate to accept the part. But Lacey quickly learns that life in the spotlight isn’t as picture perfect as she imagined. She’s having trouble bonding with her costars, her father has hired the definition of a choir boy, Donavan Lake, to tutor her, and somewhere along the way she’s lost her acting mojo. And just when it seems like things couldn’t get any worse, it looks like someone on set is deliberately trying to sabotage her. As Lacey’s world spins out of control, it feels like the only person she can count on—whether it’s helping her try to unravel the mystery of who is out to get her or snap her out of her acting funk—is Donavan. But what she doesn’t count on is this straight-laced boy becoming another distraction. With her entire future riding on this movie, Lacey knows she can’t afford to get sidetracked by a crush. But for the first time in her life Lacey wonders if it’s true that the best stories really do happen when you go off script. When Lacey scores a leading role in a zombie movie, she wants to give it her all. However, she struggles with the chemistry between her character and the leading male, the famous heartthrob Grant. Not to mention that her dad keeps breathing down her neck about finishing her schoolwork. Lacey had gone through tutors because they get sick of her indifference. But when Donovan gets hired as the next one, she finds that he’s also helpful with getting into character. Lacey doesn’t date, but she can feel Donovan growing on her. Her chemistry isn’t the only issue though. A lot of accidents have been happening on and off set and the fingers seem to point at her. Lacey is certain that someone is trying to sabotage her, but who? 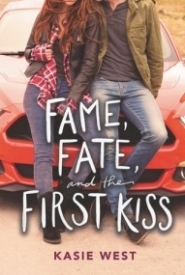 FAME FATE AND THE FIRST KISS is a story about finding out who you are and where you want to be. It’s also about discovering first love. I loved the twist of someone trying to sabotage Lacey because it gave the story just that much more. The relationship between Donovan and Lacey was slow moving but perfect for their personalities. Final Verdict: I would recommend this to fans of romance, movie sets, and a twist of mystery.